The table is set and the air is heavy with smells that make the anticipation of this meal almost unbearable. In the center of the spread is a roasted turkey, so iconic. But if you’re like me, it’s not the golden bird in the middle of the table that gets you excited. It’s the side dishes! Let’s put the turkey and wine pairings to the side for a minute and talk about wine pairings with side dishes; if you ask me, they’re the true heroes of the table! Every gathering serves a different spread, which is part of the magic this celebratory time of year. Here are just a few of my favorites and wines that make them shine. There’s one thing we can all be thankful for around the dinner table: full bellies! Cheers! This is a light bodied red wine that packs a punch in the flavor department. 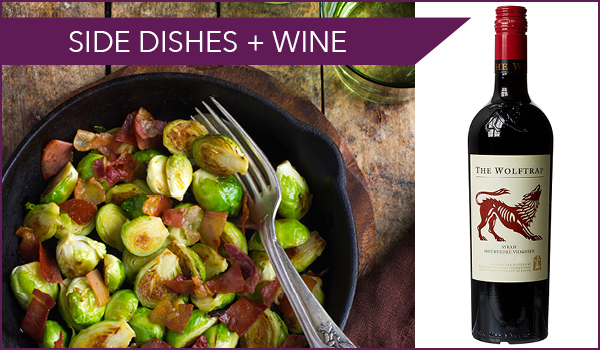 Just like the bacon and crispy edges of the brussels in this dish, this wine is all about showcasing a smoky flavor profile. Pairing it with smoky, crispy bacon and brussels, you just can’t go wrong. 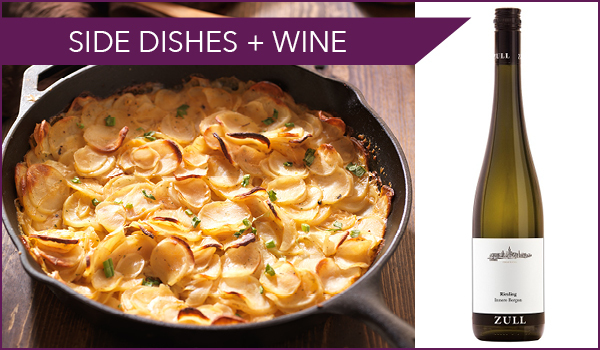 This is one of my favorite side dishes that showcases a savory flavor, but this wine will compliment any dish with this flavor profile. No matter how you say it, this dish is a delectable treat full of slices of potatoes, cream, and your favorite cheeses. What better way to balance the richness of this dish than with the perfect glass of wine. The amazing thing about dry Riesling is its ability to add freshness and lightness to a dish that is anything but. It’s almost like being submerged in a hot tub tucked away in the snowy mountains. You’re having a treat yourself moment in the hot soak, but also welcome the refreshing winter air. Needless to say, this is a wine to have with any of your decadent dishes. With roasted root veggies, you can do one of two things. On one hand, the earthy profile of these veggies can be accentuated with Chinon that also showcases earthiness. Like flavors with like flavors, so to speak. On the other hand, this earthy profile can be balanced with a red wine that showcases stewed fruit flavors like the OVR. 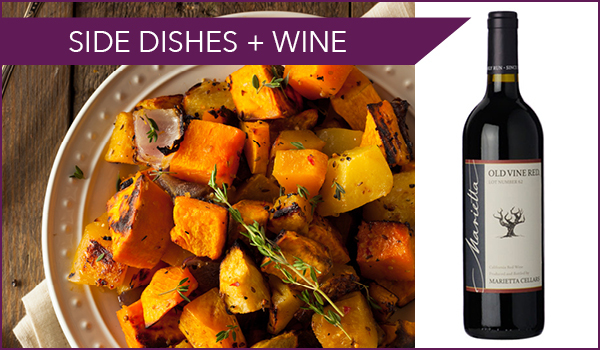 The fruitiness in this Zinfandel-dominant red blend dims the dish’s earthiness. The choice is yours, but I’ll let you in on a secret- there is no ‘wrong’ pairing!